Arranged to meet Wigg at The Duke, but there were loads of people there, so I went to the bus station to meet his coach. Somehow I managed to miss him getting off, and spent two days camped with some Geordies I met on the walk to the camp site. But I did get to see all the bands for the first two days - quite an acheivement. Then, on the Saturday night, walking out of the arena after Quo, I strolled up behind Wigg and Kev, neither of whom had been aware the other was at reading, and had met up by chance earlier in the day! Kev was all bandaged up after a wax flare exploded and set fire to his (borrowed) tent. It turned out that I'd only been camped about 20 yards from Wigg and Dan for the previous 48 hours anyway. Yet again I didn't have a camera. 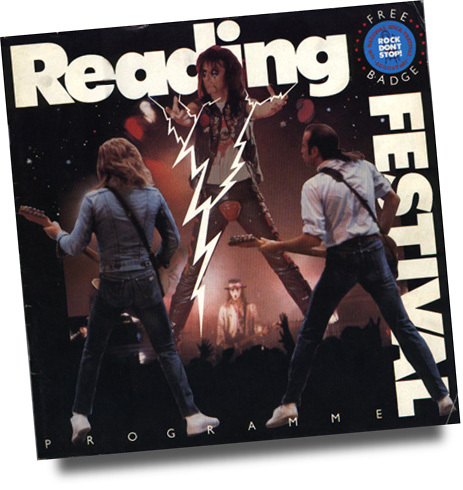 So here is the Festival programme cover from '87. Stylish. Poor old Wayne Hussey - it looks like Alice Cooper is about to crap on his head. Shame. Sadly, I can't find my "Rock Don't Stop" badge. This is the sleeve of Zodiac Mindwarp and the Love Reaction Live at Reading 1987. It took me years to track down a copy of this - not exactly a big seller.